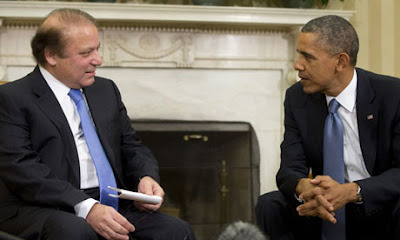 Haq's Musings: US-Pakistan Civil Nuclear Deal On Obama-Sharif Summit Agenda? US-Pakistan Civil Nuclear Deal On Obama-Sharif Summit Agenda? basically restricting Pakistan's missile range is in American interest so as to not be able to strike Israel. Also why no such condition was put for India? Am sure this is just a ploy by Americans to give us a raw deal. Americans are always trying to limit the capabilities of all countries except for its allies. Pakistan should not fall for it. India had to agree to iaea inspections for civil nuclear plants to secure this deal while for Pakistan they have put too many conditions. IMO, the deal will have the most important clause (written in hidden ink) - Clamping the Haqqani network by Pakistan. US has been unable to subdue them in Afghanistan -mainly because their bases are deep inside Pakistan, and is dragging our feet for too long in Afghanistan. Will be interesting to see if Pakistan takes the deal. My guess is, while the deal will be signed with great fan fare, neither US will provide Nuclear material nor Pakistan will clamp down on Haqqani's. Its no puzzle to me. As I reiterated before, this deal while being signed, will never be implemented, because of hidden clauses that will never be discussed in the open. I don't think US is foolish enough to believe that Pakistan will keep any of its words, considering the previous track record. "Pakistan has built an infrastructure near border areas to launch a quickest response to Indian aggression ... usage of such low-yield nuclear weapons would make it difficult for India to launch a war against Pakistan," Chaudhury was quoted as saying at a briefing meant only for Pakistani reporters, as the nuclear issue took centerstage. Pakistan maintains that the Taliban are a reality with a substantial following and the Afghan government has to find ways of accommodating them in the power structure. There is a genuine realisation both within the civil and military elite that it is in Pakistan’s vital interest that a peaceful resolution to the Afghanistan conflict is reached. Pakistan has got itself so intractably involved in the quagmire that is Afghanistan that despite sincere efforts in pursuit of peace, it still comes under severe criticism from the Afghan government and civil society. Apart from doing incalculable damage to Pakistan’s economy, internal stability and national cohesion, the Afghan fallout has soiled its reputation. Of course, Pakistan itself is partly to blame for this predicament, having blindly jumped into supporting the Afghan jihad against the Soviets in the late 1970s and then supporting the Taliban government in the 1990s, and later failing to prevent them from carving sanctuaries in certain parts of Fata and Balochistan. But that is history. Pakistan’s current leadership, ever since President Ashraf Ghani took over, has been keen to establish a durable and mutually beneficial relationship. Progress, however, has been slow and the temporary seizure of Kunduz by the Taliban has made matters worse. Surely, the prime minister will seek US support in allaying Afghanistan’s misgivings and reiterate his government’s commitment to make sincere efforts in securing peace. Nawaz Sharif is also going to draw President Obama’s attention to India’s involvement in Balochistan, Fata and Karachi. In all likelihood, Washington’s response will be that this matter is taken up bilaterally with the Indian leadership. The prime minister would be raising the issue of Pakistan’s inclusion in Nuclear Suppliers Group (NSG) and other international export control regimes. If this concession is extended to India, it should be similarly relaxed for Pakistan, as its energy deficit is even greater. Moreover, Pakistan is of the view that acceptance of India to the NSG will allow it to divert its indigenous production and build stocks at a faster pace. The chances of this request materialising in the near future, however, are slim going by the statement of the State Department that such a proposal is premature. Lobbies opposed to Pakistan try to keep memories of the AQ Khan episode alive despite our efforts at strengthening the nuclear safety and security regime. President Obama is likely to press Pakistan on agreeing to the commencement of negotiations on the Fissile Material Cut off Treaty. Pakistan finds it unacceptable to cap its enrichment programme until it has built sufficient stocks to match India’s growing inventory. On the one hand, the US is counselling nuclear restraint to Pakistan and on the other, selling state-of-the-art conventional weapons to India! The West should know by now that sanctions or the threat of sanctions have not worked in the past and are unlikely to make any significant difference this time either. Facilitating India to build its fissile material stocks is part of the broader US strategy to countervail China’s growing power at the regional level, but this has greater relevance for Pakistan’s security. The US is also expected to raise its concern regarding Pakistan’s development of short-range missiles that it justifies as a riposte to the Cold Start doctrine. Although the military establishment has tried to assure the US that its nuclear assets are safe and secure, the US continues to raise the issue, being fearful of the general security situation in the region. The Obama administration is preparing to sell eight new F-16 fighter jets to Pakistan, senior American officials said, an overture intended to bolster a tenuous partnership despite persistent concerns about Islamabad’s ties to elements of the Taliban and quickly expanding nuclear arsenal. The decision comes ahead of President Obama’s meeting on Thursday with Prime Minister Nawaz Sharif, which is to be dominated by the president’s decision to extend the American troop presence in Afghanistan and a quiet effort to get Mr. Sharif to halt the deployment of a new generation of tactical nuclear weapons. But Mr. Obama, like President George W. Bush before him, is trying to balance pressure on Pakistan with signs that Washington still considers it a vital ally. Congress was notified just days ago about the proposed sale of the additional fighters, although it is not clear if the White House plans to announce the sale of the aircraft during the visit. The Federation of American Scientists, a leading American group that monitors the spread of nuclear weapons, published a report on Wednesday that shows that Pakistan has expanded its arsenal to 110 to 130 warheads, up from a range of 90 to 110 four years ago. While those figures show a steady but expected increase, the group estimated that by 2025 the figure would rise to 220 to 250 warheads. That would make Pakistan the world’s fifth-largest nuclear power, behind the United States, Russia, China and France, but ahead of Britain, which is shrinking its arsenal. It is the nature, not the size, of Pakistan’s nuclear arsenal that tops Mr. Obama’s agenda. Over the past two weeks, officials in Washington have said they are exploring whether a deal might be possible to halt the deployment of tactical nuclear weapons that American experts fear are vulnerable to being launched without authorization, or stolen, on the battlefield. Until earlier this week Pakistani officials had said nothing about the program, although the foreign secretary, Aizaz Chadhary, told reporters in Islamabad on Tuesday that the country had built “low-yield nuclear weapons” to counter India, according to the Dawn, a major daily newspaper in Pakistan. It is unlikely that either side will talk publicly about nuclear weapons on Thursday, but Mr. Obama plans to raise the issue at length, according to administration officials. Selling Pakistan more arms, however, is an issue that is often discussed more publicly to signal that Pakistan is acting in its role as a “major non-NATO ally,” a designation Mr. Bush bestowed after the attacks of Sept. 11, 2001. The new aircraft, whose sale could be blocked by Congress, would add to Pakistan’s already sizable force of fighter jets — it has more than 70 F-16s and dozens of French and Chinese attack aircraft. But perhaps of equal importance to supporters and critics alike is the symbolic value of the sale to an ally whose relationship with the United States has been marked by long stretches of acrimony in recent years. Much of the tension has arisen from Pakistan’s ties to elements of the Taliban, especially the Haqqani Network, which is linked to Al Qaeda and is seen by American commanders as the most deadly faction of the Taliban fighting in Afghanistan. In recent years, numerous American officials have publicly and privately complained about the support to the Haqqanis provided by Pakistan’s main spy agency, the Directorate of Inter-Services Intelligence. Indian and Pakistani military doctrines that evolved over the past decade will greatly raise the stakes in any future Indo-Pakistani conflict. Pakistan will continue to invest in tactical nuclear weapons to use on the battlefield to compensate for India's growing conventional military advantage. Introducing battlefield nuclear weapons will lower the threshold of nuclear weapons use while raising the possibility of a full nuclear exchange on the Indian subcontinent. Ever since India adopted a proactive military strategy toward Pakistan in 2004, Islamabad has felt increasingly threatened and has sought to rely more on its nuclear arsenal as a counter, elevating the stakes for conflict in the Indian subcontinent. Despite political constraints to nuclear conflict, New Delhi and Islamabad's evolving doctrines and force postures have lowered the barrier for a nuclear conflict. For instance, on Oct. 19, Pakistani Foreign Secretary Aizaz Chaudhry officially confirmed Islamabad's plans to use low-yield nuclear weapons to impede advancing Indian troops under New Delhi's "Cold Start" doctrine. Cold Start — a rapid military response doctrine — is technically not an official Indian policy. In fact, Indian military leaders deny the existence of Cold Start as a concept, attributing the terminology to off-the-cuff remarks by Indian officers. Nevertheless, during the past decade India has adopted a strategy that has greatly alarmed Pakistan, driving Islamabad to invest in tactical nuclear weapons and alter its own nuclear posture. From Indian independence in 1947 until 2004, the Indian military had maintained a largely defensive military strategy on the border with Pakistan, relying on deployed border units until it mobilized forces for a counteroffensive. For example, the Sundarji Doctrine set up by former Indian Chief of the Army Staff Gen. Krishnaswamy Sundarji in the early 1980s called for a largely static defense along the Pakistani border with seven infantry-heavy "holding corps" backed by a few mobile units that would respond to any enemy penetrations of the Indian lines. As the Indian holding corps weakened attacking Pakistani units, India would then mobilize its own offensive forces in central India, consisting of three heavily armored "strike corps" that would counterattack deep into Pakistan under the protection of the Indian air force, which would be expected to have gained air superiority by this time. Islamabad is aware of the widening gap in conventional military capabilities between itself and India and is further troubled by more frequent fighting with insurgents on its frontier with Afghanistan that could create a two-front commitment. Unable to match India's growing military investments, Pakistan has taken an asymmetric approach to the new threat, building up and relying on an arsenal of tactical nuclear weapons. Understanding India's rapid response doctrine (Cold Start) could also galvanize terrorists into attempting to trigger India's Cold Start, as was apparently the case with Lashkar-e-Taiba's 2008 Mumbai attacks. Pakistan's dependence on tactical nuclear weapons greatly expands the risk of a disastrous nuclear confrontation in the subcontinent as well, enhancing the potential for the use of nuclear weapons in either a real or perceived Cold Start offensive. The stakes are now much higher in any potential Indo-Pakistani conflict. “The Pakistan Nuclear Nightmare” (editorial, Nov. 8) portrayed Pakistan as a country irresponsibly building its nuclear arsenal. We disagree. Pakistan was not the first to introduce nuclear weapons in South Asia; India was. Recent public reports confirm that India continues to grow its nuclear program by testing missiles with longer ranges, working on coming fissile material production facilities, and investing in a nuclear triad that inevitably requires a larger nuclear arsenal. India also propounds war-fighting doctrines while being ascendant as one of the world’s largest importer of military hardware. A special waiver for India for nuclear trade is another destabilizing step. Pakistan has for decades offered proposals to India for nuclear restraint, including a strategic restraint regime that could address concerns raised in the editorial. As late as September, Prime Minister Nawaz Sharif of Pakistan made fresh proposals for peace in South Asia in his speech at the United Nations. Sadly, India has refused to engage. Peace can be better served by focusing the world’s attention on India’s lack of constructive response to Pakistan’s proposals, its investment in destabilizing technologies and its aggressive posturing.